What is the All on 4 system? All on 4 is a popular method during which 4 implants are placed into the jawbones, and they form the base on which the dental system is installed on, while optimally dividing the load with minimal damage to the jawbones. 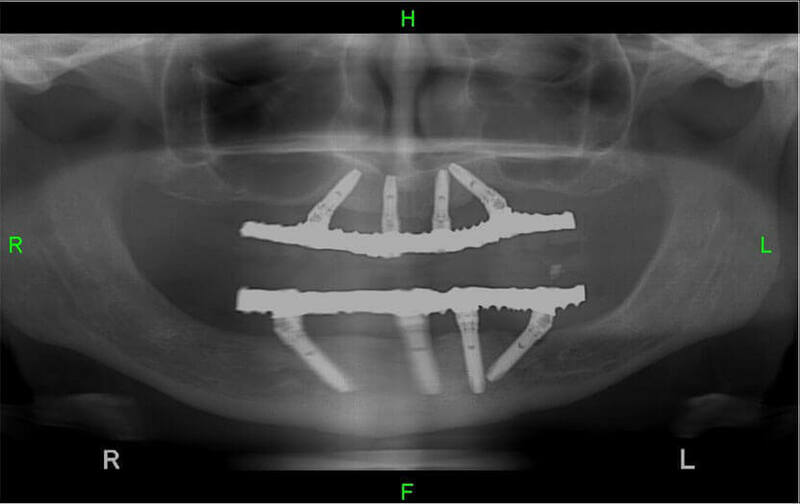 Ontop of 4 implants is attached a bridge that lays parallel to the jaw, and onto this brings are attached the crowns. 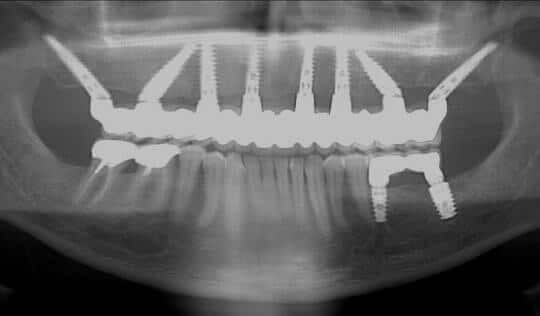 In this x-ray below presents what the 4 implants that have been inserted into the patient’s upper and lower jaws look like. On occasion, and according to the Doctor’s discretion, there are times when there is use of either 5, 6, 7, Or 8 dental implants are used in similar fashion, that combined the same method of the “All on 4” and turned this method of instant crown attachment, that is based on All on 4 dental implants that can include more crowns. What was done before All On 4? In the past, before instant attachment was an existing technique, dental implants took place over a long period of time, over months and years. The reason was that it that at the time, the acceptable approach for treatment in those years was that performing dental implants was to take place in separate stages, to allow the body time to hear from the surgical trauma it went through per each stage. 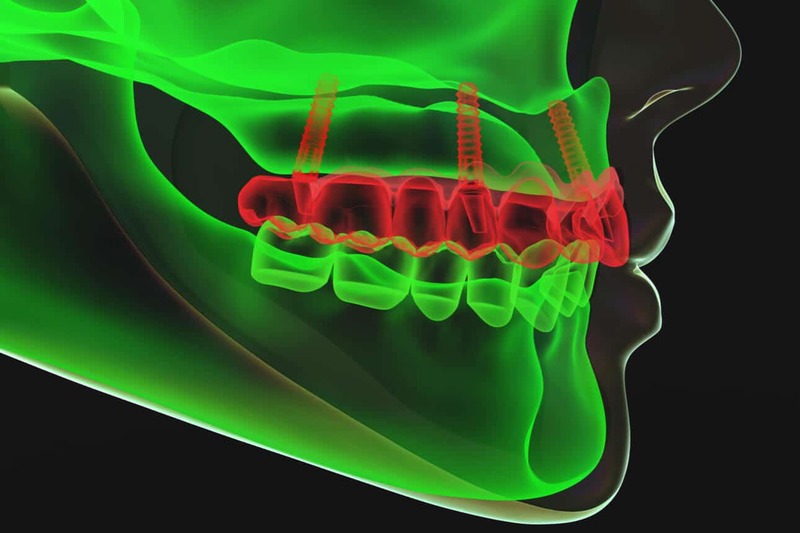 This created the situation where each portion of the procedure, ie the teeth extraction, the mounting of the dental implants, oral rehabilitation and the fitting of the crowns, took place on a different date along the treatment, and between each procedure there were long periods of rehabilitation, for months at a time. from the first extraction to the patient received his completed dental system, he had to settle for temporary solutions such as dentures. This resulted in a significant blow to quality of life for the patient and to his ability to speak and eat during the entire time up until the completion of the dental implant process, a period that would take up to two years. As a result, many people preferred settling for temporary dentures or postponed undergoing the dental implantation for as long as they could. The conceptual revolution that stands behind the same-day dental implant originated from the field of orthopedics, and is based on research showing that shortening the time length of surgical procedures and its faster completion in decreasing of the number of surgical procedures, ultimately reducing the trauma to the body, results in reducing the risks of infections and complications and increases the odds of recovery. 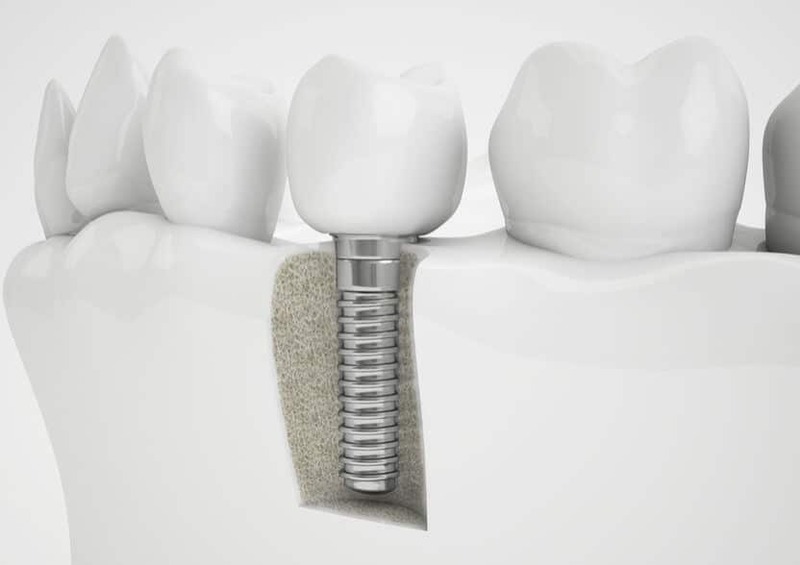 Based on this perception, the immediate loading onto implants technique was developed, as the quality and sturdiness of the developing dental implants was contributing a great deal. The result was many patients arriving for treatment in the morning and leaving in the afternoon with a new set of teeth, allowing them a return to a fully functional jaw. Just as every new technique is released, the immediate loading technique earned its share of eyebrow raises at first, both by patients and by the dental community. But reality had proven that dental implants in one day, based on the new successful implant method was just as good as the old lengthy method and in some cases, even better. Research over the years shows that immediate loading reaches high and impressive success rates of over 97%. The All on 4 method is what caused the revolution in the Dental Implantation industry. The immediate loading concept allowed the option of performing dental implants in just a single day – when the implantation itself takes just a few hours, and recovery from the procedure takes just a few hours on top of that, so that today, a patient that decided to have the All on 4 procedure done, returns to fully function on just the day after the treatment is completed. Usage of the immediate loading of 4 implants is a method that has been executed in Israel and abroad for over a decade. A period of time long enough for researchers and doctors to study the success rate in comparison to other older methods. The result was that the success rate of this method of dental implants was very high – over 97% success. High success rates of dental implant treatment based on 4 dental implants is one of the reasons that more and more dental clinics in Israel and abroad are adopting this method of central and leading in the field of dental implants. One of the main components of pricing of dental implants is the quality of the implant. Certain clinics have been able to cut the implants’ costs by using low-quality implants. But even high-quality implants are utilized, for example implants from the company Noris Medical, the price for this method of implants is lower than the older method’s prices, because it used just 4 implants for complete mouth rehabilitation. Mouth rehabilitation is based on 4 dental implants only, and provides a solution for jawbone deficiency, and that’s why it can cut costs for treatments that were accepted in the past – such as the lifting of the sinus or bone grafting. All on 4 method is considered very popular, for being available to almost anybody, at any are and with any medical condition. In the past diabetic patients, for example, couldn’t undergo dental implants and were refused treatment. Thanks to this treatment, even patients who in the past where didn’t have a plausible solution, can now undergo dental implants in one day, like patients who had implants before and the procedure had failed them, or suffer from extreme bone deficiency. Many Israelis decided to restore their dental system and chose to undergo same-day dental implants treatment in Dr. Balan’s clinic. Dr. Balan, having 30 years of experience in dental implants, is considered one of the most important sources of information in the world in the dental implant field. Dr. Balan, for the past several years, teaches professional training courses for dentists in Israel and from abroad, and stays up to date on an ongoing basis on every new research on the subject. Thousands of patients have passed through Dr. Balan’s boutique clinic in Kiryat Yam over the years, and due to Dr. Balan’s knowledge, professionalism and vast experience, they can go back to their daily routine in just one day, when they are able to smile, speak and eat correctly. Dr. Balan’s clinic is fully equipt with the most advanced medical facilities and equipment in the world and held to the highest standards. If you are in need of Dental Implants – don’t hesitate to contact Dr. Balan, who is happy to answer any question. You can contact the Clinic’s staff through this following this form below, and set up a free consultation with Dr. Balan. As part of the consultation, we will perform a comprehensive diagnosis of the patient including a CT scan, and a treatment plan will be developed. Dr. Yigal Balan, as a leading Dr. in the field of Dental Implants in Israel, is a frequent host and interviews often on specialist programs. In this video Dr. Balan is a specialist guest on a Haifa radio show and answers questions for listeners about dental implants.